Boogie Board!? 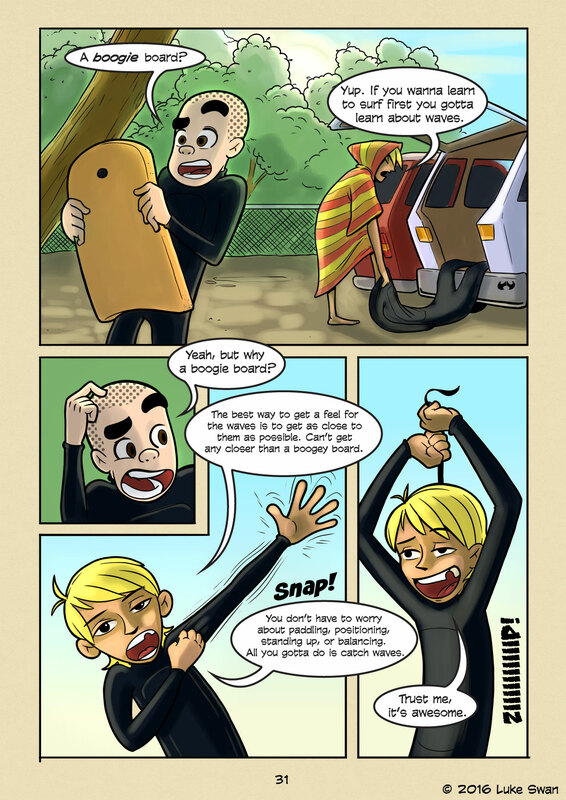 (#031) | Web comic "Surfer Joe"
Before I started surfing, I was a casual boogie boarder. I did it most summers as a kid. I remember playing in the inside surf with my dad, and he would teach me how to catch waves. He’s a pretty good teacher. He would encourage me and focus on fun first. The biggest thing he taught me was how to tell the difference between a catch able wave and one that wasn’t. There is a window that every wave has when it reaches the breaking point. It starts to stand up and cast a shadow, and at the crest of the wave you can see some light shining through the translucent water. If you’re too far out, the wave won’t break for you no matter how bad you want it to. If you are too far in, you’ll see it start to curl and then it’s too late. You’re gonna get drilled. People like to emphasize paddling(it is important). But assuming your a competent paddler I think it’s less important than positioning. Paddling in physical and almost anyone can get good if they work at it, hit the pool once or twice a week and swim laps. Or take a long board out on a small day and just paddle around for fun. Positioning is more cerebral and instinctual. You have to know where the best spot to catch a wave is, and be there. It takes a lot of time in the water studying waves to learn this. And some days it’s easier to find the “sweet spot” than others. But if your positioning is good, it only take a couple of good strokes to get into the wave and you’re off and riding. If you watch any surfer that’s really good, you see how effortlessly they catch waves. They aren’t blessed by the lady of the sea or anything. It’s all positioning. I would encourage anyone who is thinking about getting into surfing to get a boogie board first and spend a summer diving in front of waves on the inside of the break. You’ll learn a lot, and you’ll have so much more fun than if you were struggling on a surfboard straight out the gate. So grab a boogie board, a stick of Juicy Fruit and I’ll see you in the water! By the way thanks Dad!